Join Shelia from Book Journey and fellow book bloggers as we feature our first book read in 2018. 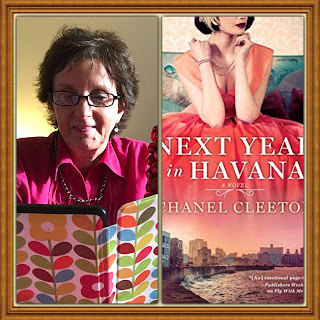 NEXT YEAR IN HAVANA by Chanel Cleeton. That looks very promising Elizabeth, completely new to me author, very glamorous cover. Happy reading, Elizabeth - this first title & the rest to come in 2018. My first book of the year is also a Kindle read. I love that cover on your Kindle! I hope your first book is great. Going to stop by your blog. Happy New Year, and thanks for commenting. I too have shelves and shelves full of books, a Kindle I have just had to replace because it is groaning at the seams, one cupboard full of knitting wool and another crammed with jigsaw puzzles, all as a comfort blanket so that I will never be out of things to do!! - Chance would be a fine thing!! This book looks like a complete about turn in writing style and storyline for author Chanel Cleeton and is one I might consider for my own list, although in isolation from everything else she has written. I have just finished a cozy mystery which I started way before Christmas and I have selected my first book proper of 2018 - 'Fallen' by Emma Kavanagh. I can't see anywhere that you have read it and I really think you might enjoy this one. I didn't know Chanel Cleeton had other books. Her writing is beautiful. LOL on all of your shelves, Yvonne. I keep meaning to read a cozy mystery, but I never get around to it. Thanks for commenting, Yvonne, and all was good at Christmas and New Year's. Your first book would be a new setting for me. Think I'm going to have to add it to my teetering TBR pile. Hope you enjoy it. The book is quite good. I have never read a book set in Cuba either. I love choosing the first book of the year, this was by far the hardest. Happy New Year. Why was it difficult for you, Marce? Fun that you chose two books. I look forward to your review, Elizabeth. Great pic! Happy New Year! I don't have a colored screen on my Kindle Paperwhite and figured a double screen would be fine. Thanks for commenting, and Happy New Year. I'll have my first review for the year posted Wed. Happy 2018 to you as well. Great on posting your first review on Wednesday. I hope you are enjoying this one...looking forward to reading your thoughts on it! Happy New Year!!! Thanks for commenting, Kristin, and Happy New Year!! I am glad I am not the only one to hear books talking! Happy New Year. I don't think any of us will ever be out of books to read though I worry sometimes I won't get all the ones I want to read read. Next Year in Havana looks wonderful and I hope you're enjoying it. Happy New Year! Next Year in Havana is/was very good. What's Your Number So Far This Year?